It’s a bit of a stretch to call a meal with one pre-ground spice a ‘curry’ - but it definitely made it more appealing to cook and eat! So whilst it's a bit ambitious to call the meal I came up with a 'curry', I ended up being quite chuffed with it and felt the name merited a bit of gravitas! The one downside is that, if you cook it for one person you do end up with half a can of leftover tomatoes and half a can of leftover coconut milk. These can be frozen, but hopefully over the next few weeks, I will provide links of what other meals to cook with these ingredients, so you don't have leftovers. So - back to the curry - the can of coconut you see in the ingredients had been lurking in the back of my cupboard for at least 12 months, so it was kind of a miracle that I thought of something to cook with it tonight. 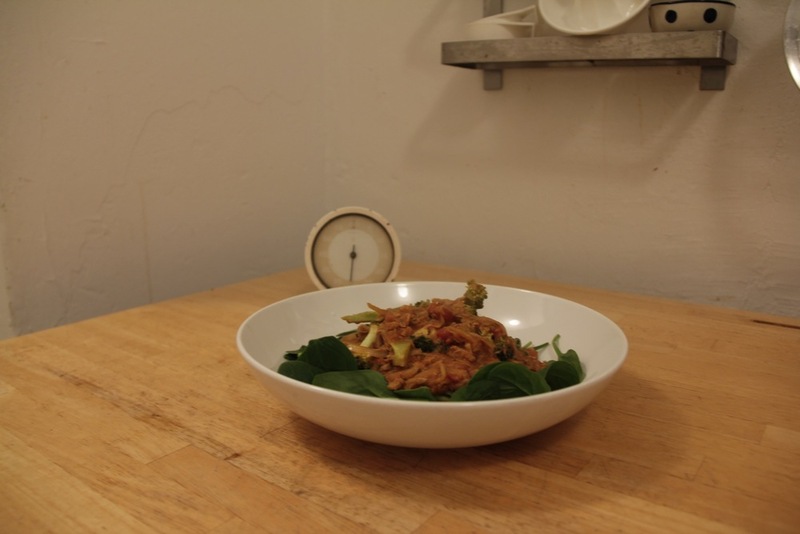 The thing about desperado dinners is that I usually don’t want to be in the kitchen at all – so it means that I try and do everything as quickly as possible and with as little washing up as possible. From the pictures you will see this is a meal I ended up feeling quite smug about! From feeling there was absolutely nothing in the cupboards, to creating a relatively nutritious, quite yummy meal, with washing up that was done and dusted while it cooked. #Result! Hopefully it shows that even if you don’t have too many fresh ingredients to hand, with a bit of thought it's always possible to create some sort of meal. When looking at the ‘recipe’ make sure to read the notes – you will see how easily it can be adapted to suit the ingredients you have available. Also note, that you don’t need to be precise about the amounts of broccoli, cauliflower and spinach – base it around how how hungry you are, how much you think you should be eating to meet the daily quota of vegetables we’re all meant to be eating etc. I chose to make cauliflower rice, but you could also have added cauliflower to the dish and used real rice. Another thing it highlights is to always try and have a packet of frozen vegetables on hand, e.g. frozen broccoli, peas or spinach could have been used if you did not have anything fresh available. Read on for step by step pictures, or scroll to the bottom for the recipe and notes on how to adapt the recipes to your liking. 1. Saute onions until translucent, then add all ingredients to the pan. 2. 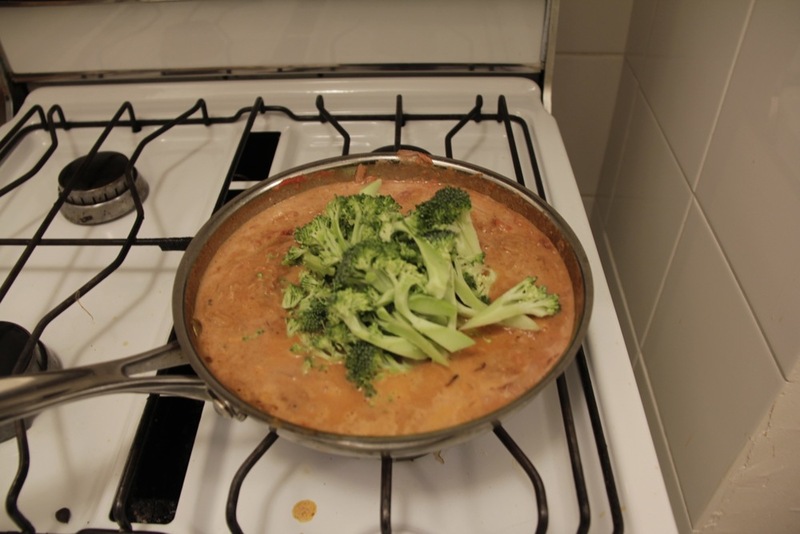 Bring to a simmer, put the lid on and simmer for approx 4 - 5 minutes until the broccoli is cooked to your liking. 3. Whilst the broccoli is cooking, prepare the cauliflower rice and spinach. Add salmon, canned tomatoes, coconut milk, Moroccan spice mix, broccoli and mix through. Bring to a simmer then put lid on the saucepan and simmer gently for about 5 minutes until the broccoli is cooked to your liking. 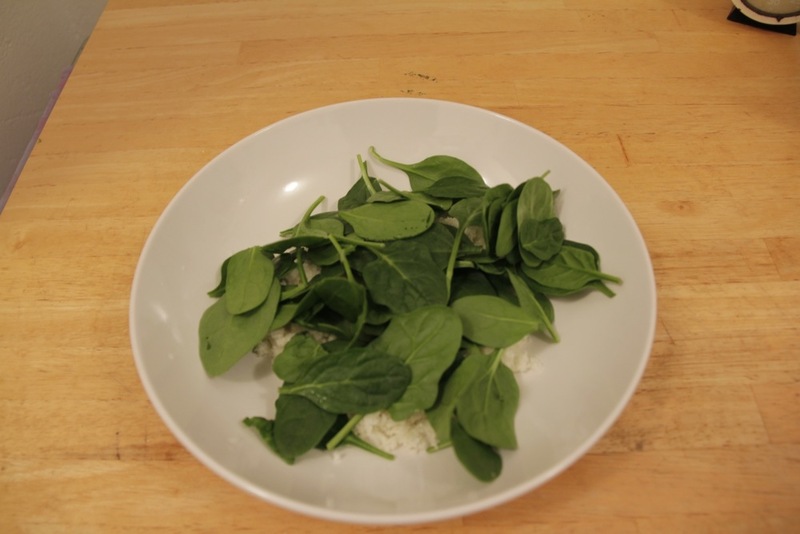 Serve on a bed of spinach and cauliflower rice. Don’t have a pre-mixed Moroccan spice? Garam Marsala or cumin is a good substitute. Which size salmon tin should I use? ‘ Supermarkets sell several ‘small’ sizes – just choose which one suits you. I prefer real rice. No problem, either cut the cauliflower into small florets and add to the pan at the same time you add the broccoli or skip it altogether. (Cut it a bit smaller than the broccoli as it takes longer to cook, and you want them both to be ready at the same time.